Have you ever been told that you grind your teeth? Tooth grinding [bruxism] is an oral habit which involves clenching and grinding of the teeth. It is not uncommon in our society. Approximately 50% to 96% of adults experience bruxism and 15% of children acquire this behavior. Most often, this habit goes unnoticed by the person. Bruxism can occur during the day or night. People with emotionally stressed personalities characterized as being aggressive, controlling, precise, or having time urgency and achievement compulsion, tend to develop bruxism malocclusion (teeth that are not aligned properly). Children whose parents brux are more likely to develop this habit than children whose parents do not brux. We can make you aware of the habit and suggest behavioral therapies to stop the bruxism. Stress reduction and coping techniques can be initiated to reduce the emotional stress you may be experiencing. A removable intra-oral appliance can be made for you called a nightguard or bruxism splint. 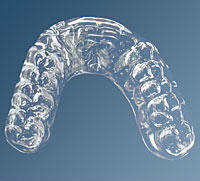 The mouthguard protects the teeth from the forces of clenching and grinding the teeth together. A mouthguard or nightguard is more practical for treating the night bruxer than for those who have daytime clenching and grinding habits.